Keep your tabletops tidy with this clear rectangular sugar caddy! This sugar caddy is a classic sugar caddy with a traditional rectangular shape and versatile clear construction. Side cutouts make it easy for customers to pull out the desired sugar or sweetener packet, while smooth, rounded edges give it an inviting appearance. These rounded corners also promote safety, minimizing sharp edges, and they ensure easy cleaning without harsh 90 degree corners. At the same time, a sturdy plastic construction makes it very resistant to damage while promoting cleanability. With this sugar caddy, you'll be able to store up to 20 yellow, blue, pink, and white sugar packets with ease! I use these for everything but Sugar. My favorite use for the clear one is to put the little individual packets of the kleenwipes at each table in the Dining Area. Parents appreciate that they are readily accessible. These sugar caddys are great for holding various things, especially their main design. It's easier to see contents of items inside with a clear look. We have these plastic sugar caddies on all of our inside tables, outside tables, and bar seats. The fact that they are clear allows us to match them to any other supplies we may be using. THESE ARE WONDERFUL LITTLE CADDIES, JUST PERFECT FOR YOUR SUGAR PACKETS. TOTALLY CLEAR, SO YOU CAN SEE THE DIFFERENT KINDS EASILY. INEXPENSIVE AND WASH UP EASILY. I Bought one of these to see if they could hold alcohol prep pads, and they fit perfectly! Even though its listed as a "sugar" caddy, they can easily be used to hold things such as the prep pads, sanitize wipes, moist towelettes, etc. Multipurpose and super cheap, you cant go wrong with these! Excelent product the perfect for your service, great plastic construction, perfect fit for 20 sugars, great shape, the clear one look good in the table. 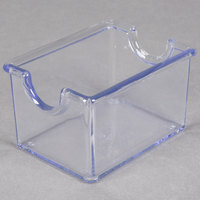 this clear plastic sugar caddy is a handy little box for storing your sugar and creamer packets. nice economical product here available in various colors. The caddies are inexpensive, attractive, and well made. The clear color looks nice, and they hold a fair number of of Splenda packets. They are a greast value, especially since I expect it to last for years. My one issue is that it is an odd width that is neither wide enough for 2 packets, not narrow enough to keep them tidy. The result is that the packets are a bit messy and chaotic looking in the caddy. This clear plastic sugar caddy is perfect for any restaurant or café. Holds coffee creamer and sugar packets or can be used to store just about any small objects from paperclips to thumb tacks. We just use these for little storage bins around the restaurant and they are great. They can crack pretty badly if dropped but most of them are still fine. Great caddy for the price. We keep several of these on-hand for catered events. If the host rents drink dispensers or coffee urns we normally add a few of these to the order at not charge. I think these sugar caddies are great; however, I don't use them for sugar. I use one for salt and pepper packets, one for hot sauce packets and one for lemon juice packets. They are a perfect size for these. We just love these clear sugar/creamer caddies. Nice thick plastic holds up nicely to repeated use and is easy to wipe clean. Priced nicely too! To keep all my sweeteners all together and ready to use, this caddy is the best. Because it is clear, I can easily identify what I need. This sugar caddy is clear and can't hold up to twenty sugar packets. We suggest using organic raw cane sugar however this caddy can be filled with regular sugar, sweet and low, or Stevia. The caddy is very inexpensive and easy to clean. It is made of a durable plastic. I was looking for a holder for my sweeteners. I figured I'd give this one a try since it wasn't too expensive. Actually, I am impressed by the shininess and overall look of the product. Sometimes I feel like acrylic has a cloudy look or develops that cloudy look. I've had the product for several months and am super pleased with it. It's perfect because it serves its purpose and looks good (and is well priced!). While the black sugar caddies look classier and a little more modern, I like the visibility that the clear alternatives provide. You can see exactly what you're getting. I like the clear design of these sugar caddies. It makes it easier to distinguish between different brands when they're packed tightly together. Love it. The Clear Plastic Sugar Caddy is perfect for my condiments. It doesn't take up much room on my counter top so I can leave it out which is very convenient. The quality is pretty good for the low price and I would definitely purchase another caddy if needed. Glad I bought this sugar caddy. I buy my sugar packets in bulk and it's nice to have this caddy to keep some out on the counter in an orderly fashion. These sugar caddies are great and very affordable. Are the the nicest looking or most aesthetically pleasing? No, but they hold a lot of sugar packets and you can't beat the price. These came prepackaged so they did not scratch which was nice and can be used for many things. I using for table settings for a wedding. This sugar caddy does the job. The clear plastic doesn't look as good as the black plastic but it works. It holds quite a bit of sugar and is pretty thick. I love this clear sugar packet holder for my Stevia packets. The clear is such a beautiful and classy color and goes with everything. Great quality! The clear version of this caddy looks more plastic than the other colored versions do. Still a nice product however built very well you would have a very hard time breaking this. I have had these caddies for over a year and they are good as new the quality is exceptional and will give you years of use. Love these for our cafe.. Such a great price and pretty indestructible. We use them for sugar and one for toothpicks. Highly recommend these cute caddies. Purchased the clear sugar caddy for home use. I was surprised how many sugar packets could fit in this small caddy and it's made of a very strong plastic. My favorite of the sugar caddy's webstaurant sells. I think it looks very nice, and is made out of a strong material that should last for a long time. These are indestructible. Bought our first one over two years ago. They've been dropped, smashed, etc and not a scratch to be seen. And they're dirt cheap. What a value! We use clear plastic caddies for non sugar sweeteners. People can easily see that that is the item that is in there, allowing those who eat a low sugar diet to easily grab this product. Basic and inexpensive these sugar caddies fit the bill. Easy to move not heavy like my previous glass ones which always seemed to get broke. simple easy and does what it should..stacks your sugars in a a nice clear plastic caddy display. was very fair price and was shipped fast. Simple sugar caddy great for storing sugar packets. We enjoy ours and even use some in our break room to keep things organized you could uses these for business or home. This clear little caddy is perfect for small coffee areas in the break room and kitchen area. Allows you a quick view as to what is in it and if it needs to be restocked. The12 pack of clear sugar caddies works great. Buying this in bulk really saved the cafe a lot of money. Shipping was faster than we expected and we will be purchasing additional colors of black and white in the future. Thanks for a great deal and a great purchase experience. Purchased this sugar packet caddy for home use instead of having them all disorganized in a canister on my counter. Very nice quality and excellent price. I prefer this clear caddy rather than the solid ones because then customers can see the full packets and recognize what is what much easier. I have several of these in my restaurant and they are very durable! This is a good table piece for the money. The clear option makes the item appear to be a little higher quality vs. the others options. Excellent addition to any dining room table. It has the classy appearance. The caddy is made from good material. they have been dropped but still is ticking without any cracks or chips. These are a great replacement to our current sugar caddies. We really needed something new to dress up our tables a bit. So nice to find this product. these are very nice sugar caddies. they hold quote a few sugar packets. looks really good on the table. they are very easy to clean. I bought these sugar caddies for a private party that I catered with 16 tables and approximately 100 guests. They were just as pictured clear color, good solid plastic material and they looked very professional on the white tablecloths we used. I was very impressed with the quality. This little caddies hold several packs of sugar or sweetener. They are not big and in the way, they are just right for the table. This is exactly what youd expect it to be. The best part is how cheap they are! Very durable and sure to last a long time!!! Theres not much to say about this prodcut except they are very versitile and used by many types of restaurants. You won't find them at a cheaper price. Great item for the money. We use these on all of our tables and they are durable and do not feel or look too cheap. these sugar caddies are in right shape for us to put on our tables. they look nice and strong enough for restaurant usage. not easy to break. I ordered a few of these as they were reasonably priced. The intent was to provide the raw sugar packets and splenda packets in these but we thought they were just 'too commercialized' for use at our B&B so we're saving them for another use. Nice qualtiy. They do get a little discolored but an nice wash will keep them looking new. We bought a lot of them and still have them. We picked up the Clear and Black Plastic Sugar Caddys for our sweetener packets and tea bags, which all fit nicely, not too snug. The caddys have little bumps on the bottom to stand off the table a bit. However they do not stack well! They should have designed the bumps on the bottom of the caddys to help with stacking. Too bad. But still useful and reasonably priced.